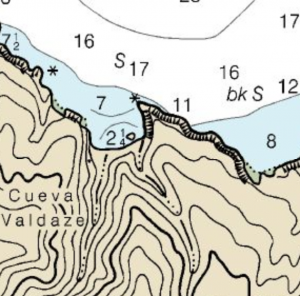 The Cueva Valdez valley and three-entrance cave on the beach mark this excellent anchorage. This anchorage is quite beautiful and has been a favorite picnic spot for more than a century, but it is fairly open to the northwesterly swell. Most people consider this a fair-weather spot. We have to agree. We anchored here late one March afternoon in light winds with no appreciable swell. Though the weather was clement, we briefed procedures for making a rapid get away in the event that wind and or swell started setting into the cove. A valley runs into the beach and is easy to see from a distance. There is a large uncharted rock near the western wall. A large uncharted rock is just below the surface and just about the point you’d like to anchor – up against the western wall of the cove. We didn’t see the rock, but anchored about 100 yards east of the caves. We drove in as close to the beach as we felt comfortable, dropping a stern anchor in 20 feet of water. By the the time we had enough scope out astern to afford a pull back, we found ourselves letting go the bow anchor in about 40 feet of water. We snugged ourselves up between the two and spent a quiet night. There’s a smallish pointy peak immediately behind the anchorage. Actually, it’s easier to identify the valley that runs into the anchorage and form its sandy beach. In the picture, the most prominent valley is straight ahead, with another to the left. These valleys are visible, particularly in low sun angles from a great distance. A kayak-through sea cave is the best landmark. You know you’re in the right spot when you see the sea caves on the western wall, one of which opens from the sea directly onto the beach. 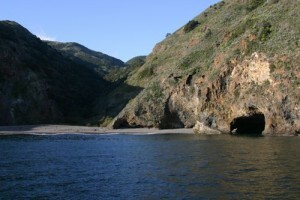 The eastern part of the cove is obscured until you’re well inside the anchorage. It doesn’t look like a safe place to anchor. First, if wind or swell come up at all, you’re on a dangerous lee shore and pretty well boxed in, second there just isn’t very much room. The beach is one of the nicest on the island, certainly the best on the north shore. 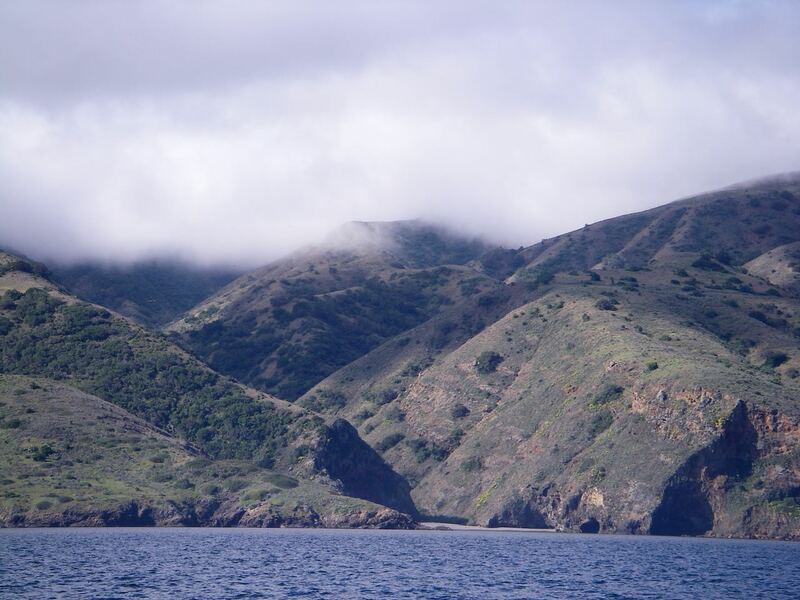 If you intend to go ashore, you’ll need a landing permit from the Nature Conservancy. There’s a link in the top-of-the-page grid. Rissos dolphins accompanied us as we left the anchorage. 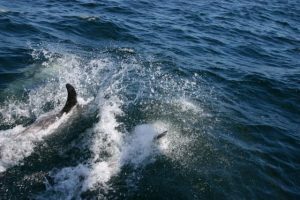 As we left the anchorage, we were joined by a huge pod of Rizzo’s dolphins. They’re not usually gregarious, but this pack stayed with us for half an hour, maneuvering as we tacked. Three or four stayed at our bow for 10 minutes or so and then three or four more would take their place. They’re big animals, much larger than the Common Pacific Dolphin we usually see. According to the Eder book on Whales, they are often seen swimming with whales and other types of dolphins. She nailed that, for right in the middle of the pod was a truly big creature, a whale we could not specifically identify. We were there in late March, so it could have been a late Gray transiting the area.